CHICAGO (MarketWatch) — If you’re planning a long-distance driving trip this summer, take some advice from Patrick Long, Le Mans race-car driver and official Porsche factory driver: Get plenty of rest, stay hydrated, maintain proper posture and stability, and stay focused. “Being well-rested is as important for performance on the race track as it is for safety on the road,” said the endurance racing champion who has three American Le Mans GT2 championships under his belt, as well as other GT2/GT wins that include 20 other ALMs and 10 other major sports-car wins. He’s also won three major Daytona Prototype racing-car events. Though the speed is far greater on a racetrack — Long pushes 205 mph when racing, compared with 65-70 mph on the highways — he said the basics of driving are the same. That’s true whether it’s a 24-hour Le Mans circuit or a three-day road trip from Naples, Fla., to Los Angeles that he and his girlfriend took in April to get to the Long Beach Grand Prix. “You have to be responsible behind the wheel and completely focused on the task,” said Long, who has driven in seven 24-hour Le Mans, seven 12-hour Sebring, eight Petit Le Mans, seven Rolex 24s at Daytona and four 24-hour Spa races. On their roadtrip, the two got early-morning starts, changed places about every three hours, grazed on fruits and vegetables, kept well-hydrated and got plenty of sleep through 20-minute power naps and early bedtimes. During endurance races, he usually drives three hours on, three hours off. On breaks, he catches 45- to 60-minute naps, eats well-balanced foods and even exercises. Long wears four layers of fire-protection clothing when he’s racing and that creates an enormous amount of heat and sweat. “I have to continually hydrate to stay ahead,” he said. He pushes a button that dispenses water and electrolytes into his mouth when he’s racing, but keeps bottled water and natural-fruit energy drinks nearby when he’s driving long distances. “Keeping the electrolytes and water flowing through our systems is imperative for staying ahead of the sweating in a race,” he said. Here’s another reason to stay hydrated: It could save you from leg cramps, which are almost always connected to dehydration and are hard to get rid of. “It takes so long to recover from any little bit of dehydration,” he said. How do you know when you’re well-hydrated? You can monitor it by the color of your urine, which should be a champagne shade, he said. Some vitamins like B complex, however, will affect color. Keep your spine straight during long-distance driving and keep your lower back secure in the seat. On the racetrack, at triple-digit speeds, the centrifugal force is pulling the driver’s body in many directions. As a result, Long is nearly immovable in a race car with two straps across his hips, two between his legs and two over his shoulders. He’s belted in as snug as he can pull the five-point pinch. 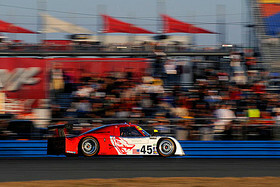 Patrick Long races in the Rolex 24 at Daytona, Fla., January, 2011. Keep your body at a 75- to 80-degree angle in the seat, using the back of the seat as your cushion, not a pillow or rolled-up sweater. Don’t lean way back or to your right or left. Keep your hands in the 10-2 position you learned in driving school at an arm’s length distance with a slight bend in your arms. Long keeps the heel of his right foot flush with the bottom of the accelerator pedal and the seat far enough away from the wheel so that his knees are not touching the wheel. “It’s important to have some support under your hamstrings from the seat to prevent low-back pain,” he said. “We learn in intense sports psychology that the mind can only process one thought at a time,” he said. Though he communicates with his racing team through speakers in his helmet and the car, he said he keeps his concentration on the road. 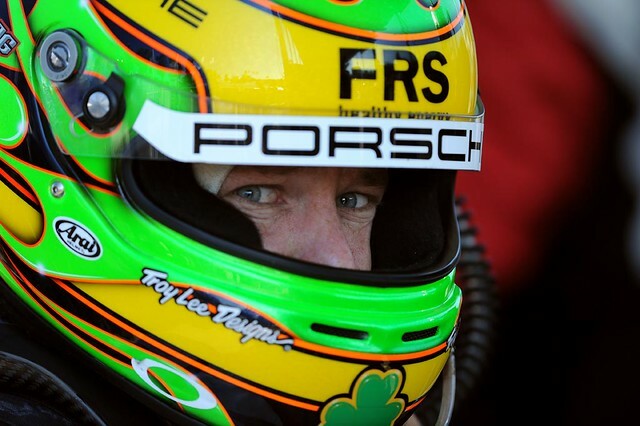 Patrick Long is among the most talented American sportscar racing drivers of his generation. A two-time winner of the 24 Hours of Le Mans and three-time American Le Mans Series Driver’s Champion, Long has been racing for Porsche since 2003. Long was snapped up by Porsche after an early career of karting and Formula Car racing across Europe. Since joining Porsche, he’s become the youngest-ever American to take class victories at the four “classic” endurance races – the 24 Hours of Le Mans, 24 Hours of Daytona, 12 Hours of Sebring and Petit Le Mans – and notably raced for Team Penske in the 2008 season. Born and raised in Southern California and fluent in five languages (English, Spanish, German, Italian, French), Patrick has lived internationally and raced professionally since age 16. Despite having lived throughout Europe from an early age, he’s never lost his enthusiasm for the SoCal lifestyle, and continues to surf, ride motocross bikes, cross-train on his road and mountain bikes and escape to his family’s Mexican surf shack to vacation. One of the perks of Patrick’s job with Porsche is the ability to train with and be monitored by the team of doctors who works with Germany’s Olympic teams. A fitness fanatic, Patrick uses FRS products, his favorite flavor is Orange, to stay hydrated and sharp during both long training sessions and in preparation for endurance racing – more often than not in a car with a cockpit temperature exceeding 120 degrees.